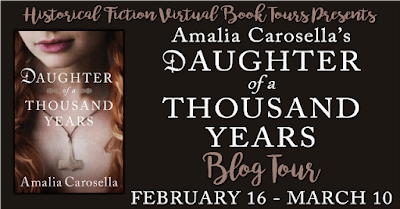 Daughter of a Thousand Years In the Wilds! 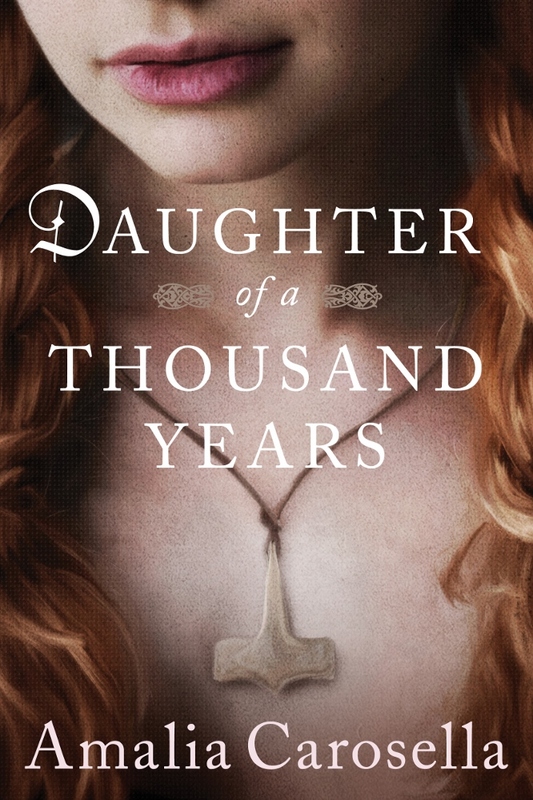 DAUGHTER OF A THOUSAND YEARS released yesterday! It's been a wild ride, start to finish, but I'm so happy to have the opportunity to share Emma and Freydis's stories, present and past, with the world! 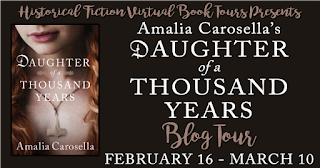 Today is the obligatory earliest blogtour reviews round-up post, in the hopes that hearing the great things people are saying about DAUGHTER will persuade any of you who may be on the fence about clicking that pesky buy now button! Amalia Carosella’s newest novel is beautiful, honest, and relevant, speaking boldly of our right as Americans to worship as our hearts direct, at a time when we most need to hear that message. Daughter of a Thousand Years is a touching examination of honesty in faith and the personal nature of religious belief. It’s also great historical fiction, with the rich detail and excitement that are hallmarks of all Carosella’s books. 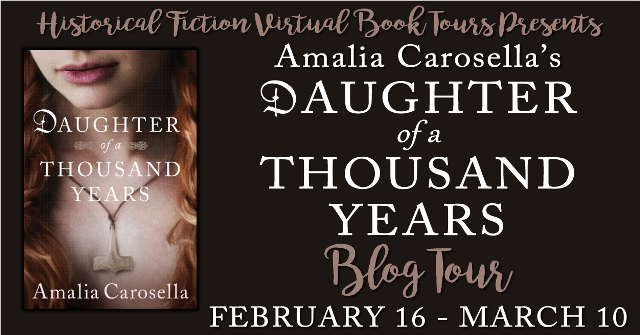 From experiencing public bias, to relationship struggles and families, Author Carosella has given this book a spirit that shines through her strong women characters. Without faith bashing on any fronts, she is able to show cultural and religious bias that still thrives in our everyday lives. I have never, ever had a book hit me so hard. It has challenged my beliefs. It has forced me to step outside of my comfort zone, to study the beliefs that my ancestors held to so fiercely. That people today, hold to so fiercely. Well written, as always from Ms. Carosella, and well worth a read for the historical details, and for the theological discussion, if you're in the mood for one. Freydis was a woman ahead of her time, she didn't want to waiver from her beliefs and yield to society demands but to forge her own destiny even when they could end with dire consequences. Emma and Freydís are strong women that show immense courage, they are both true to themselves while trying to live up to their family's wishes. [...] Overall, a wonderful mix of historical fiction and contemporary fictions that compares women's struggles and religious persecution through time. If you like to be swept away in a good historical fiction read, and like memorable reads with strong female characters, this is a good book for you to dive into eyes first. Pick this up as one of your highlights of the first half of 2017. *phew* That's a lot of reviews so far! And I am SO GRATEFUL for each and every one of them! Please visit the blogs of all these fantastic reviewers and check out the other works they've read and recommended -- because without bookbloggers, authors would be kind of up the creek without the paddle, as they say. And you can follow along with DAUGHTER's blogtour as we forge ahead -- the complete schedule is found on many of the linked reviews above, and also at Historical Fiction Virtual Blog Tours; many thanks to the fabulous Amy, who set all this up for me. (And you!) In addition to reviews, we've got some interviews coming down the pipe, and I'm looking forward to sharing all of that with you all as the month marches on! In the meantime, I hope you'll give DAUGHTER a shot, and if you enjoy it (or, you know, even if you don't), please do consider posting your review on Goodreads and/or Amazon! I don't know about you, but with that as my other option, I'd definitely be more inclined to consider running myself straight toward someone else's sword in heroic battle. Especially if the woman who greeted and embraced me should I die of old age or illness was only half human flesh. Half-alive, even. But what if her appearance is more than just the indication of her monstrous birth -- the child of Loki and the Giantess, Angrboða -- and potential threat to gods? What if it signifies the grief of loss? Of the women who were left behind when their husbands went out as Vikings and never came home again? Sure, their bravest and boldest men went to Valhalla to be waited on by Valkyries, or got to dance their nights away with the goddess Freyja (by all accounts, very beautiful and highly sought after as a bride by the frost giants, who are obsessed with marrying her) but those women, who did not or would not die in battle had lost their men and sons for eternity. There was no hope of reunion when the dead were divided so absolutely in the afterlife. What if Hel is the representation of their heartbreak, their suffering, their grief, in knowing they will never embrace their loved ones again? For that matter, it could be the representation of all loss of that nature. The husband's loss of his beloved wife and child in childbirth -- when just hours earlier the world had been full of life and promise, now cruelly stripped away, there is only a half life left, while stumbling through grief. It seems likely to me that Hel, responsible for those kinds of deaths, would embody their suffering physically as well. But what a miserable existence, taking charge of so many forsaken spirits. And having been forsaken by the Aesir, to rot with Hel in Niflheim, is it any wonder that the dead in her domain rise up against the gods in Ragnarok? Perhaps it's their grief that makes them do it. ***There's also an idea of a family mound -- a burial place NOT in Niflheim, but perhaps within your own property, where your soul would reside with your ancestors and family members. So perhaps of the sick and old-aged, it was only those whose bodies were not laid properly to rest or given the proper rites who resided in Hel's domain -- the forgotten and the exiled and the outlawed would certainly make a sorry bunch. Since family and community were so important, the foundation of society really, this would make a lot of sense to me. I incorporate both the idea of the Mound and Thor's hall for peasants in DAUGHTER OF A THOUSAND YEARS. *In those days, a good many of those who would have died of sickness were probably women and children, most especially in childbirth. Norse women could and did go off to plunder and fight as vikings, with new evidence suggesting they were more prevalent in those parties than we previously thought, but childbirth was dangerous then, and there was no telling what was on the other end of a pregnancy -- life or death. The idea of Hel as half alive and half dead, then, is rather fitting. It almost seems to me as though every woman had one foot in the grave in those days, especially if she was married and bearing children. ** This sounds to me like the place where Loki is bound, what with the venom dripping down into his face and eyes and the presence of the serpents. But there isn't any real specific information on where Loki was imprisoned, and since when he writhes against his bonds he causes earthquakes, it seems to me that implies he's trapped beneath Midgard somewhere. Maybe that's where Nifleheim is, though. It's hard to say how it all maps out. You can pre-order print, kindle, or audiobook! Daughter of a Thousand Years is almost here!!! Ahhhhh! And don't forget you can still enter to win one of 100 kindle copies on Goodreads, or join us for the blogtour beginning this Thursday! "The divine Æsir are twelve." Then said Jafnhárr: "Not less holy are the Ásynjur, the goddesses, and they are of no less authority." 1) Odin the All-Father, of course. Married to Frigg, who sees all fate. But make no mistake, Odin is the man in charge. 2) Thor, who oddly is not immediately acclaimed as god of thunder-- though this might have something to do with Snorri's bias and his intention to turn the Norse gods into men*. Instead, Thor is attested to primarily as the strongest god, and of course there is a mention of his goat-drawn chariot, Mjolnir, the belt which doubles his strength, and the gloves that help him grip his hammer. He rules the course of the wind, and stills sea and fire; on him shall men call for voyages and for hunting. 4) Freyr, son of Njördr and twin brother of Freyja. He's god of rain, sun, and growing season type things. Basically he takes care of the crops and prosperity of that nature. Snorri says he's the most renowned of the gods, but I don't buy it. 5) Freyja, daughter of Njördr and twin sister of Freyr, and when Snorri calls HER the most renowned goddess, I have no trouble believing it. Freyja was a war goddess, riding out in her cat-drawn chariot, and of those that died, she split the warriors down the middle with no lesser god than Odin himself. In addition, she can also be invoked as a love goddess. Freyja is also counted among the Ásynjur. he is most daring, and best in stoutness of heart, and he has much authority over victory in battle; it is good for men of valor to invoke him. It is a proverb, that he is Týr-valiant, who surpasses other men and does not waver. He is wise, so that it is also said, that he that is wisest is Týr-prudent. 7) Bragi, of course! The Poet! God of wordsmithing and skaldship. Snorri calls him a god of wisdom as well, and he's married to Idunn, who is the only goddess capable of picking the golden apples (Snorri says she only guards them), which the gods require to keep their immortal youth and strength. He needs less sleep than a bird; he sees equally well night and day a hundred leagues from him, and hears how grass grows on the earth or wool on sheep, and everything that has a louder sound. He has that trumpet which is called Gjallar-Horn, and its blast is heard throughout all worlds. I'm not entirely sure how great an attribute it is to need less sleep than a bird, but the rest of it is pretty excellent. Snorri also claims he has golden teeth, which seems kind of impractical, all things considered. I bet he has some SERIOUS hot/cold sensitivity when he eats, if that's true. 9) Hödr somehow makes the cut into the essential twelve, though he's blind, and sadly he's the god responsible for the death of Baldr (who apparently doesn't get included anymore, and seems to be dead already, when this was written which does not really bode well for anyone). Kinda-sorta. If being tricked by Loki counts as responsibility. He doesn't really have any other attestation besides "sufficient strength" in this opening summary of the Asgardian gods, so I'm not sure why he's included at all, really. I mean, SUFFICIENT strength? really? That's like saying the guy is adequate with a sword. I dunno about you, but it doesn't inspire a lot of confidence in ME. 10) Vidarr feels like another place-holder for the twelve-of-which-there-are-actually-fourteen. He's nearly as strong as Thor, reliable, and evidently "the silent god." But. Well. That seems to be all he has going for him. Seems like a pretty dubious honor to me. 11) Váli is explicitly named as a son of Odin by Snorri (the only god aside from Thor, so far, though there are plenty of other attestations to a plethora of Odinsons around and about). He's another god who can be counted on in a fight, and has a talent for marksmanship. 12) Ullr is a son of Sif (who oddly enough was not named when Snorri first brings up Thor, but he does mention here that Ullr is the step-son of Thor, which implies that Sif is Thor's wife, if a bit after the fact), and even better with a bow than Váli. In addition, he's some kind of pretty, and... really good on snowshoes? I feel like we're reaching here, Snorri. But his saving grace seems to be as a god of single combat, and since that seems to be all he really does, invoke him then or never! Loki is beautiful and comely to look upon, evil in spirit, very fickle in habit. He surpassed other men in that wisdom which is called 'sleight,' and had artifices for all occasions; he would ever bring the Æsir into great hardships, and then get them out with crafty counsel. And there you have it! The Twelve (ish) Aesir, according to Snorri. Three of which aren't Aesir at all, but Vanir, and several more of which are pretty, well... underwhelming to hear about. Unlike the Olympian gods, there's a lot more overlapping and kind of random seat-warming among the Norse gods. The prevalence of warriors makes sense for the Norsemen, who as we all know, valued reputation exceedingly, and often went out in search of it, either by exploration or raiding -- and let's be real, the exploration would usually become raiding at some point, unless the lands weren't occupied. But again, I think it's important to reiterate -- Snorri is only one source, and he only offers us one small snapshot for a particular non-religious purpose, and he wrote his Edda hundreds of years after Iceland officially converted to Christianity, and even longer after Christian ideas started seeping into the roots of Norse Myth and practice. So whether more than just Snorri considered these particular gods to be The Twelve Aesir or not -- we can't really say. And whether Snorri's interpretation of these gods as the highest was even true for Iceland and its pagan height... it's hard to know for certain. *Thor being the most popular of the Norse gods among the common people would be the uppermost god to unseat, and leaving out all his supernatural abilities in this attestation goes a long way in making him a lot more human, and a lot less impressive as a god. If I had to make a guess, I'd say that's a big reason as to why Snorri conveniently doesn't bother to mention anything beyond Thor's strength in the GYLFAGINNING. Don't forget to enter to win 1 of 100 (!!!) 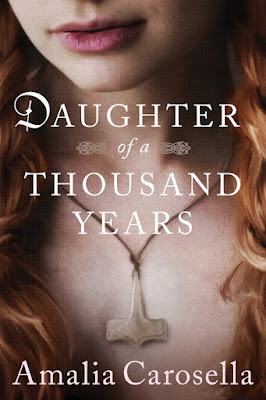 kindle copies of DAUGHTER OF A THOUSAND YEARS on Goodreads, or just go ahead and give it a pre-order if you prefer! I wanted to post an overview of the Norse gods today, but I realized I probably needed to talk a little bit about the difficulties that Norse Mythology presents, as far as determining well... anything about it, honestly. Unlike the Greco-Roman tradition, for which we have many pre-Christian sources*, Norse Mythology was only preserved in written form AFTER the majority of the North had converted to some form of Christianity or another. This means that ALL of our sources for Norse Mythology (with the exception of a couple of Latin authors) were written VERY late, and (again, with few exceptions) after the pagan system of belief had been largely dismantled. Snorri, one of the primary authors of what we have left of Norse Myth is himself a Christian, and makes his reasoning and agenda quite clear -- he's preserving (Icelandic) Norse Myth not for the purpose of maintaining the lore of the pagan faith tradition itself, but for the purpose of preserving the poetic forms which he saw as an important cultural heritage and inheritance of Icelanders. In the prologue of the Prose Edda, in fact, he takes great pains to discredit the idea of the Norse gods as divine beings, going so far as to turn them instead into kings and princes -- of TROY. Adding to the problems presented by source bias as relates to faith, what was preserved at all is only a small sliver of a vast and highly variable, highly localized breadth of beliefs. Primarily, those that belonged to Icelanders. But even all Icelanders likely wouldn't have worshipped the same gods in the same way or necessarily in the same order of precedence. Broadly speaking, I'm sure they shared more than they didn't on the island, but every community would have had its own variations on those thematic broad strokes. And the same can be said for the Norse-pagans in Norway or Denmark or Finland or Sweden. From one village to the next, practices and beliefs might well have been wildly different, never mind from one larger kingdom or country** to another. We have this prevailing idea of these old faiths, in our modern Western World, that they were monolithic, like Christianity*** is or was. But Nordic peoples didn't all have one holy book from which they built their faith, they had no scripture, no state-organized or imposed faith traditions or rituals that united them all (though later, certain kings might impose certain rules -- or demand all their people be baptized, etc). They relied by and large upon wise women or men, shaman-priests and seers, to direct their individual communities. And while some of these wise women (for example) might have traveled from community to community, making rounds, and engaging in rituals that might have been common between one village and the next, the needs of those villages would not all have been the same, and the direction dispensed, therefore, would not have been the same, either. What worked for one group, one tribe, one village, one community, would not necessarily work for another. So. All of that is said as a kind of disclaimer, before I give you any kind overview of anything Norse Myth related -- because it's important to recognize that any overview we glean from the sources is already deeply flawed and cannot be truly representative of what was once a/many vibrant and living, wide-ranging, cultural and faith tradition(s) or belief(s). And not unlike the pre-Christian Norse peoples, Heathenry/Asatru/Norse Paganism as a whole today is just as deeply and widely variable and just as highly localized -- there truly is no one way, and even when we might agree on one element generally, it doesn't mean it will look the same from community to community. But... that kind of makes community that much more important, I think, because without it, you lose an essential compass point in making sense of the experiences you might have had, spiritually and otherwise. *whether you believe the authors were atheists or agnostic or not is another issue altogether, which I won't get into today because we've already got our hands full. **I use the terms kingdom and country loosely here -- because what we consider to be a united nation today was obviously not necessarily the same united nation of the viking age, if there was a union of tribes at all at any given time. ***I think at this point an argument could be made that Christianity is becoming less monolithic by the day, because local church community to local church community, even within the same town, might interpret the scriptures in extremely variable ways, but again, that's another conversation for another day.